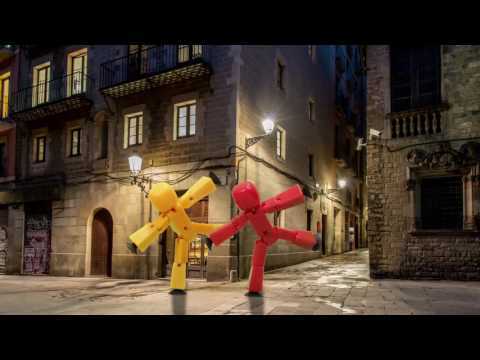 StikBots are stylish poseable characters used to make your own animation films with lots of different backgrounds. Each Zanimation set includes one solid colour StikBot person and dog, a tripod, stage and two prop boxes. The free iOS and Android StikBot Studio mobile App snaps individual photos and stitches them together into a film, complete with built-in music and sound effects. StikBots can be posed in countless ways - their limbs, torso and even neck can be positioned at multiple different angles. The green Z-Screen function allows you to upload your own photos or use the many images available in the App as the background. Flip the set and it becomes a blue screen to be used with a green StikBot. Film, pause and edit your StikBots then share with friends or on StikBot's popular social media site # StikBot. Ridiculously good fun and very addictive! Zombie Popper - Shoot his brains out! Soft foam shooter - squeeze & his brain shoots over 20ft! Incredible Height Chart - Brilliant Fun! Measure yourself against iconic people, creatures & bizarre objects.